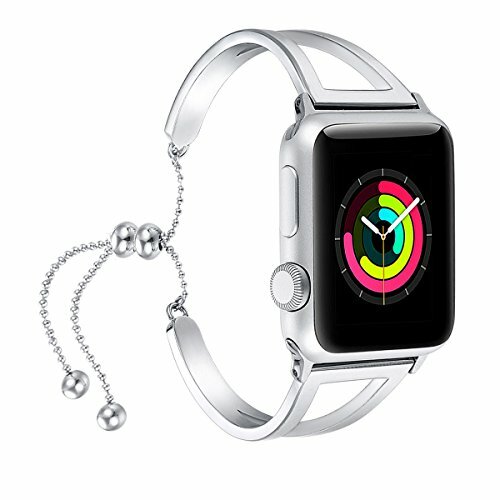 Waiting for a long time for our Unique new style Fastgo Apple Watch Band/ Iwatch band to come out? Here it is finally: 2018 Fastgo Newest Dressy Eyecatching Apple Watch Band, suitable for Holidays, Parties, Concerts, Gifts Etc. 1*Fastgo gift box as package. Size: It is size adjustable and fits for almost all of female wrists. Also It fits all Apple Watch versions: series1, series 2, series 3, sports & edition. This color is really perfect to match the iWatch, it makes people feel it is very expensive. Each strap is handcrafted, it is light weighted, with beautiful workmanship and very attractive. It is an unique and shiny gift idea for any occasion: Christmas, Birthday, Valentines day etc. This listing is for the replacement strap only. Apple watch is not included. Warranty: For any issue, kindly contact us and we will definitely give you response within 24hours. Fastgo is a registered trademark and brand in United States and protected by US Trademark Law. Fastgo never authorizes any other third-party to sell our products, and please directly buy from Fastgo to get the authentic products in guarantee and protect your own interest. ◆【Updated technology】: Kindly note that this Apple Watch Bands/Iwatch bands Series are with updated New technology to make it stay on and never get loose. So kindly buy from "fastgo" and get the most "Secure"version. ◆【Buy from "fastgo", support the"original"】: It is designed by Ms Rachel of "fastgo" in early 2018. So it is the newest unique released design Iwatch Bands in our shop in 2018. Kindly choose to buy from "fastgo" only and be careful about the copiers. ◆【Material】: Nickle free, Allergy Free, 304 stainless steel, durable and textured and nice polished. No tarnishing or discoloration or getting rusted. Super easy to adjust and take off, well made and sturdy. ◆【Size】: This stylish snug dressy Apple Watch Band is size adjustable and one size for all. The size can be adjusted by sliding the chain balls up and down. And kindly slide the ball one by one. And it fits for Apple Watch Band Series 3/2/1,Sport, Hermes, Nike+, Edition, all 2015, 2016 and 2017 models. ◆【Occasions】: This Iwatch band is elegant and classy, it is suitable for holiday parties, concerts and very proper to be used as gifts/presents for Wedding day, Birthday, Valentines' day, Mothers' day, Christmas, Thanksgiving Day etc. View More In Smart Watch Accessories. If you have any questions about this product by fastgo, contact us by completing and submitting the form below. If you are looking for a specif part number, please include it with your message.